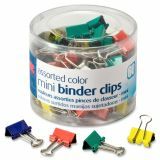 OIC Mini Binder Clips - Durable clips offer wire handles for upright hanging. 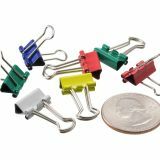 Each clip is made with a corrosion-resistant coating and offers a 1/4 sheet capacity. High-quality, durable metal clips come in five assorted colors and are packaged in a reusable, plastic storage tub.